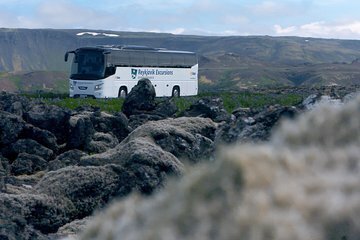 Hoppa över linjen och spara pengar genom att boka din transfer mellan Keflavík International Airport och Reykjaviks BSI Bus Terminal, precis utanför stadens centrum. Avgångar från flygplatsen ansluter till ankomna flyg, så avsluta flygplatsen, hoppa ombord på bussen och sätt sedan in för resan. Du kan använda den gratis inbyggda WiFi-enheten som du leder till staden. The shuttle was on time and the driver was friendly and helpful. This is the best way to and from the airport! It's easy to find the bus outside the airport and the ride was smooth and comfortable. And it's economical, no need to spend so much more for personal shuttles.I was not aware when I placed my order that I can order hotel drop off and pick up. Make sure you add this because it can save the hassle waling from the central bus stop to your hotel. Buy it on here, show your voucher at the bus station counter. Easy day. Goedkope goede service. De bus gaat regelmatig dus je hoeft nooit lang te wachten en hij stopt vrij centraal op het busstation in Reykjavik vanaf waar je kan lopen naar je accomodatie of een taxi of bus kan nemen. Flybus is great! So easy to find when arriving in airport. Runs on time, frequently, and has Wifi. Our host recommended using Flybus always trust the locals and we are so glad we did! This couldn't have been easier. It was easy and manageable.